Have you tried Citrus Lane yet? My kids always enjoy my boxes when I get them. 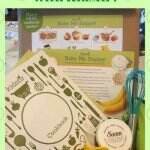 If you are not familiar with Citrus Lane, it is a subscription box with children’s products. There are usually 4-5 products in each box, including snacks and toys and maybe a personal care item (maybe even a gift for mom!). Up until this point, all the boxes we’ve received have had what I’d consider “gender neutral” products. However, I noticed this one was actually really girly! Maybe it’s because my daughter is 4 and more into “girly” things than younger kids. But I digress. Goodbyn Bento style box–This lunch box has a larger compartment and two smaller ones, plus 2 small detachable containers to holds dips or sauces. This can go in a lunchbox or just hold snacks if you like! Fresh Feet wipes–I haven’t had an occasion to use these on my kids’ feet yet, but they also work well for wiping off little faces when out and about! Back to Nature cheddar crackers–My kids always love snacks and crackers are among their favorites! So It goes without saying that they devoured these as soon as they were allowed to have them! Faber Castell markers–My daughter was super excited about these. There were 12 of these double ended markers in the package, so 24 colors altogether. I rarely let my daughter use markers, and never without supervision, because I just don’t trust her to not color on the wall! Crocodile Creek butterfly watch–This is K’s first watch, and she was excited about it, because it made her feel all grown up to have one. However, she didn’t actually end up wearing it much–probably because she’s not used to it. If you are interested in trying a box for yourself, check out the Citrus Lane website. Use code TAKETEN to receive $10 off your first box! Have you ever tried Citrus Lane? I’d love to hear your thoughts on it! If you like this post, please take ONE second to retweet! This looks so neat!!! Could they do a box for multiple children or is it per child? This box is per child. But my kids usually play with each others’ stuff anyway!